Hello – my name is Hannah Hobden. I work for GeoTraceability and I’m here to challenge you to turn full traceability – from bean to bar - from an aspiration into a reality for the cocoa sector. Traceability systems are the operational infrastructure on which you hang data to create transparency. An effective system requires full traceability from bean to bar and the ability to capture data as the product moves through the supply chain. Technologically this is possible, as I will show later. The challenge is how to implement a system in cocoa. To do so will require collaboration and, ultimately, a willingness to move away from a mass balance system – because mass balance effectively creates a wall against transparency and traceability. But before we go any further, what do mean I mean when I say that a full traceability system provides the operational infrastructure to create transparency? Well I like to think about it in terms of a train track. A tracing system is like the railway tracks that link different components of the supply chain – for example farmers, warehouses, ports, factories …. Once the tracks are in place different information can move along them between the supply chain stakeholders. In the case of cocoa this could be information on the producers, such as data relevant for monitoring gender equality, living income, deforestation, use of child labour. Information can be collected on the price and bonuses farmers receive for their cocoa and this can be compared with the amount of money received by the cooperative. In the past we have created risk assessments for child labour at a farm level and we are currently in discussions about doing this at a community level. Having this risk assessment data as part of a traceability system would mean a final batch of cocoa having a child labour risk level associated with it. Data can be collected on the cooperative, warehouses, ports, factories. The quality of the cocoa can be tested and recorded at different points along the supply chain. What I am trying to demonstrate is that once the tracks of traceability are in place, multiple levels of data can be added. But, to be most effective, tracing data needs to start with the farmer and a bag of cocoa and go all the way along the supply chain. Mass balance interferes with this because it creates a barrier against the movement of data and information and so cuts the tracks off between farmers and final customers. So, you might now be thinking, that’s all very well Hannah but it’s not realistic to achieve. But I’d like to challenge you and say that with collaboration and investment into existing operational frameworks it is possible. I think the most inspirational story to show what can be done is from the palm oil sector. As I’m sure you are all aware, there are significant challenges in palm oil around deforestation. Many of the consumer brands have made promises to have supply chains free from deforestation and have decided to use traceability as one tool in achieving this. However, making the link between mills and farmers was a significant challenge. As in cocoa, there is a complex web of smallholder farmers, cooperatives, and middle men. For a while it seemed hopeless. But two years ago, we started a project which was a collaboration between IDH, Wilmar and ourselves to pilot a tracing system linking farmers to fresh fruit bunches, fresh fruit bunches to middlemen, and middlemen to mills. 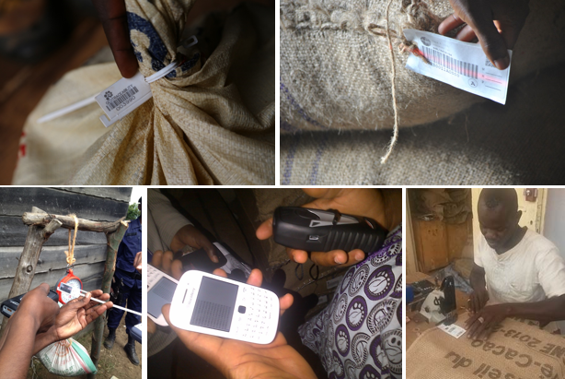 The system was simple and effective and demonstrated the possibility of laying the tracks of traceability between the farmers and the mills. This initial pilot allowed us to develop a commercial model, which we are now able to roll out to other mills, this time without the need for donor funding. And now the basic tracing system is in place, we are able to increase transparency though data collection. So, we are collecting data on the farmers’ production methods, which allows us to create business plans for each farm for productivity improvements. We know the exact size and location of each field and so can monitor over time whether these fields encroach into forest. We can record what training each farmer has received and any follow-up visits they’ve had. We have delivery records of the amount of fruit a farmer sold, on which date and for what price. We can record all this information again when the middleman sells the fruit to the mill. A key factor in palm oil is that the fresh fruit needs to be processed within 42 hours of harvesting. So, we have started implementing an alert system which notifies the mill when fresh fruit bunches have been collected from the farmers but not delivered to the mills for processing – this means the mill can take actions to retrieve the fruit before it goes off. The technology is also available to send text messages to the farmers informing them of when trucks will be sent to collect their fruit, or when training will be happening on a topic. This simple tracing system from farmer to mill can then be linked with the tracing systems already being implemented at mill level and further along the supply chain and relevant data passed along. I am not saying the issue of deforestation is solved in palm oil by any means, but what I am saying is that something which seemed impossible three years ago – having full traceability along the supply chain – is now possible. So, what needs to be done in cocoa to make traceability a reality here too? Others in this session are discussing transparency at a policy level so what I want to focus on are some operational solutions. Firstly, from a technology perspective there are plenty of solutions out there. The key is that technology should be collaborative, in the same way that organisations must be. Therefore, when investing in supply chain data and traceability systems it is essential that they are interoperable – this means regardless of who is providing the technology, it will be able to link to other systems. So, overtime you can link tracing data with mobile payments, cooperative sales records, soil testing, financial support, farmer loyalty schemes etc. Secondly, we need to start implementing traceability from farmer level. 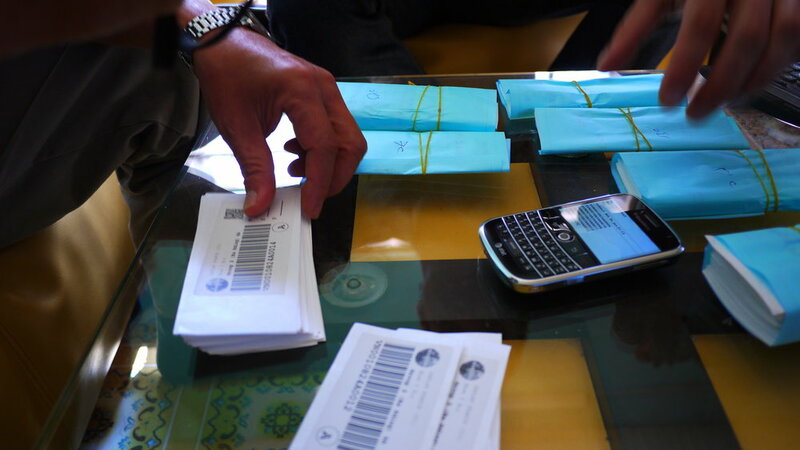 At GeoT we have worked with the traders and exporters to implement tracing systems. But the issue here is that these organisations do not usually use the systems that are implemented – they pass the data onto their clients, who get frustrated with the fact that slightly different data is being provided to them in multiple formats by different organisations, but who usually do not have the power to demand specific data from their supply chain. So, my suggestion is to copy the palm oil model and develop a tracing system that can be implemented initially by cooperatives and build up from there. This is particularly important to do because it is at this level that we need to tackle the significant challenges of living income, deforestation, child labour, modern day slavery, and climate smart agriculture. Commercial models need to be developed for systems that allow cooperatives to take charge of their own data collection and provide traceability data to the people they sell to. We have already started working with Root Capital in Cote d’Ivoire to provide a basic data collection system to cooperatives but more needs to be done to enhance this and ensure relevant data is captured and effectively passed along the supply chain. I expect momentum will develop around traceability in cocoa as we see continued political pressure for it by national governments and internationally; organisations needing to meet their own traceability commitments and so having to start tackling the traceability problem caused my mass balance and not knowing who their farmers are; and collaboration between organisations to develop a commercially viable system that works for the private sector. So, I hope I have inspired you today with the possibilities for transparency and communication along the supply chain which are possible when full traceability is in place. I’ve challenged you for the need of greater collaboration to make traceability a reality for cocoa and have suggested a simple place to start is with farmer organisations and cooperatives. You think you’re investing in a traceability system – is that really the case? I have had the chance to meet and discuss with many supply chain and sustainability managers across multiple industries and geographies. I often realise that there is confusion on traceability and traceability systems. Some people think that they trace their raw materials by subscribing to a digital solution or by complying with a certification scheme, but they don’t. Some clarifications would certainly be useful to understand what is happening and make the right decision when investing in a traceability solution. The International Organisation of Standardisation (ISO) defines food traceability as the ‘ability to follow the movement of a feed or food through specified stage(s) of production, processing and distribution’, and a traceability system as ‘the totality of data and operations that is capable of maintaining desired information about a product and its components through all or part of its production and utilisation chain’. If we replace feed and food with raw materials to cover all supply chains, it is obvious that ISO is referring to physical traceability: tracing in space and time the raw materials as they change their status to become ingredients or components of a final product. We can even go beyond this to how the final product is terminated and recycled. There is no reference to a ‘one step back, one step forward’ approach, which so many organisations seem to limit traceability to. A proper system should trace all the way through a supply chain and consider all the tiers. So, if the system you use doesn’t physically trace raw materials, ingredients, components and products, you should not claim that you’re performing traceability. Is it possible to say your supply chain is overall 10% traced because you know your suppliers three tiers down? In my opinion, no. But you could say, if you can prove it, that 10% of your procurements and products are 100% traceable! Most of the standards certifying products use a mass-balance approach, where certified raw materials, such as cocoa, coffee, tea, palm oil, cotton, are mixed with non-certified ones. Is this traceability? Absolutely not. These standards don’t even ask the organisations selling certified products to indicate on the wrapping what the ratio is of certified and non-certified raw material in a specific consumer product. Sometimes certification standards use the segregation or identity preservation model. This only results in proper traceability if the raw material is physically separated from non-certified products at each stage along the supply chain and if the final output (the consumer product) can be linked with the initial input (the raw material). This is rarely the case in the certification world. Another method that we often hear about is administrative traceability or a chain of custody approach (following the paper trail). Again, this is not traceability as you track product movement and transactions with volumes and quantities but not the product as such. You can record in a system that a consignment as moved from point A to B and changed ownership but can you confirm without any doubt that no product substitution or contamination happened? Let’s now look at digital supply chain mapping and supplier risk assessment systems. We found many providers offering this type of solution and some of them insert ‘traceability’ in the description of their system. Sorry but mapping all the tiers of your supply chain and assessing the risks for each supplier doesn’t result in traceability. However, if you put in place a traceability system and you start tracing the raw materials throughout all the tiers to your own facilities (end to end traceability), you’ll obtain a detailed map of your supply chain, updated for each consignment you’re receiving; thus, killing two birds with one stone. Some digital systems will put the emphasis on product compliance and give you the tools to verify it. For example, you could document at different tiers of your supply chain if the cold chain requirements are respected, regulations are observed and your product specs are applied. Again, this information is certainly highly valuable and useful but this is not traceability. At this point, you might want to ask is there a solution on the market that could perform traceability, risk assessments and compliance assurance at once? To my knowledge no, but if you know of one please let me know. Why is this? Each of these systems is inherently complex and when applied to large logistical and manufacturing operations the level of complexity only increases. If you need to pursue the three objectives, you’d do better with three different systems that, and this is very important, could interoperate with each other (pull and push data from system to system). If you ask your IT provider if their system can interoperate with others and if they use APIs, and they look at you as a deer does at night on the road in the car’s lights, walk away! At GeoTraceability, we’ve deliberately developed a traceability system adapted to the raw material produced by smallholders. For us, traceability starts at the production site - the field, the forest - or at the extraction site - the mine, the sea. The main originality of our solution is the ability to combine geo data with traceability data. Not only do you know the origin of the raw material but you also know who produced it, how, and what could be the human and environmental impacts. This upstream information will follow the raw material throughout your supply chain and enrich as other relevant data is added. Do not hesitate to contact me if you wish to discuss further traceability and supply chains matters. It will be my pleasure to exchange with you. The biggest threat to your brand and reputation happens when performance does not meet expectation. So, please don’t claim that you perform end-to-end traceability when you don’t.